It was 1980. Video games were taking over our worlds if you were a boy anywhere from 8-15. 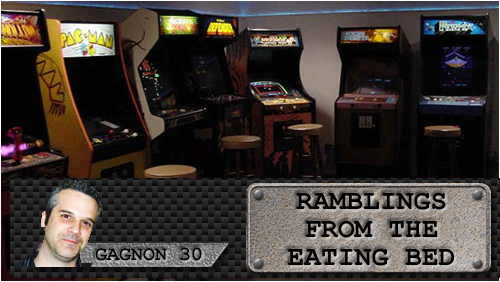 Now the main place to play them was still in a good old fashioned arcade. But the Atari 2600 had already been around for a couple of years on the retail market and that year of 1980 saw Intellivision go from test market to retails as well. But there was that OTHER place to play games. Or was there? We had heard of it, but it was the of the proverbial chupacabra and sasquatch mythology. Now the toughest part of this innovative/ground breaking and unquestionably legendary game was finding a computer. Being in the city of Calgary Alberta in 1980, it was still a small city. Offices just didn’t have a lot of computers back then. You were more likely to find a microfiche machine than a computer in many places. I can remember the very first time this type of gaming came to my attention. Now I was 10 going on 11 in 1980. A computer was something most of my buddies had only seen at the theatre and more specifically on the bridge of a Star Destroyer. Actually, we referred to video games like Asteroids as internally being computers. (My friends and I) A computer you typed on that was all text was tough to find, it was an office tool and it was expensive! So one day my stepmother had to go into work on a Saturday for an hour or so. She asked me if I wanted to tag along, she mentioned they had new computers. SOLD.. I am in. Let’s see on e of these new fangled contraptions. We get to the office downtown and she goes to her business after introducing me to this guy she works with who is going to show me one of their computers. Okay.. that last part isn’t true.. I mean we ALL KNOW nobody wears watches 30 years later. Okay, so I sit in the chair in front of the screen and he pops up Zork. My mind was about to be blown. The imagination is a wonderful place you see. Text based games, like a book (UH… BOTH HAVE WORDS) allow you upon taking in the information to paint the picture in your mind any color you like. When people say “The book was better” when they see a movie, it is many times because you have set a standard in your own mind. You have expanded on the basic and normally see things that enhance the mood with something that really hits home to you personally. I had only about an hour that day playing Zork for the first time. I had to learn what you could and couldn’t type in to progress for a good chunk of it! It was literally thrilling at times to see the response once you hit enter. Even if you were just deciding which direction to go in a hallway, there was tense air as you decided. Looking back now the story and flow is simple and looks to the layman form the outside as uninteresting. But they couldn’t be further from the truth. 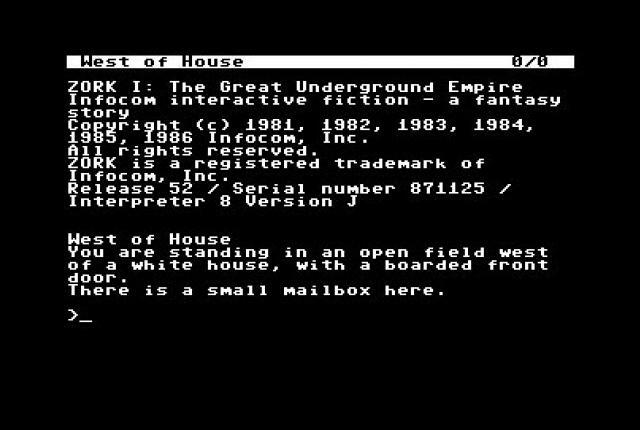 Zork and similar text based games are their own genre that honestly I believe stand the test of time. They are books that allow you to decide the story, and just seem to take more creativity to play that a modern day game where with HD graphics and surround sound have. Of course modern day games add MUCH more game enhancing things. But it doesn’t seem to be as robotic as nowadays. I mean Zork amongst other things is the first ever LINEAR campaign! (That’s a LOL moment right?) There ARE limited choices to make when all is said and done. I wrote a lot as a kid and young adult and honestly, a fame like Zork had its influence it giving ideas that my mind expanded on. I became a better writer, had a better imagination in part because of this game. I believe a Zork type game should be part of a Creative Language course in schools. It ties in video games and the imagination. It’s an easy segway after playing the game to have your students start writing a same type decision making story, or simply rewriting the events and expressing those pictures they painted in their minds! Its true with my Halo addiction I enjoy the expanded written universe. But I also see so many who play it oblivious to that or the story behind Master Chief ect ect. You don’t need to know these stories to play after all, but for me it’s a rather empty way to appreciate a game to a large degree. Okay, I don’t expect people to flood back to text based games. But I appreciate what they were, a great time to play! Yet also limited by technology, accessibility and probably underrated. It is easy to set back with a controller and make the reflex moves we have running down a hall in a shooter game conditioned by so many hours doing it. It’s fun and everything, but am I getting through to at least one other person when I say. “There is something missing?” I mean, at its base, the text based game is missing visuals and sound as you sit in front of the screen.. BUT it’s the HD 5.1 surround sound game that lacks a very simple edge sometimes.